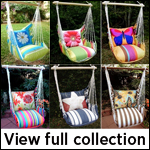 The hammock chairs featured in this collection of swings combine modern design with retro patterns of stripes and zigzags reminiscent of garden designs from the disco era. Updated with a modern feel, these new hammock chairs are the most comfortable items appearing on the market for outdoor furniture today. Attach this swing to a tree branch or on your porch or patio to enjoy reading a book, catch up with a friend, or listen to the wildlife outdoors. Each swing is designed to hold up to 250 pounds of weight with the help of a special 33-inch wooden spreader bar created from strong Chilean pine. 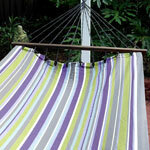 The polyester cushions are machine washable, resist weather and mildew, and will not fade. These cozy and comfortable chairs are perfect for entertaining guests during a special outdoor occasion.